To Collaborate, or not to Collaborate–What was the question? Group work has become increasingly important to my courses and, like Janette (thanks for the great video! ), the day where I don’t implement a group component to my course is becoming rare. (I used to teach under the quarter system, where class periods were about an hour each time, so group work was a less frequent aspect of my pedagogical training–so the function of it within my classroom is evolving). Before getting into specifics about a collaborative assignment I do, I want to throw in a few thoughts I’ve been having that sort of reverses the conversation present in the bibliography for this week. The bibliography, and even Warnock to some degree, seems to focus on how online collaboration creates unique challenges not present in the class and that, really, in-class collaboration is potentially easier. I’m not sure how I feel about that overall, having not taught online, but I do think there are two points where online collaboration creates unique opportunities that rectify some of the difficulties of in-class groups. 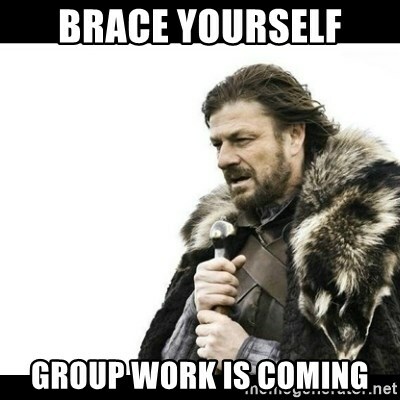 Group work is often difficult in classes because student friend-groups have already been established, are often brought into the class, and often make students reluctant to work with others. I’m experimenting in my f2f classes with how to work around this, but online group assignments really don’t need to take this into consideration as much. Of course, I’m sure certain people won’t work well with each other, but that’s something that evolves over time rather than, usually, something brought in on the first day. (I find it interesting, though, that Janette actually cites issues of personality online as a difficulty–I’m perhaps just dealing with an especially difficult set of f2f personalities right now!). Based on what Warnock says about the textual basis of online teaching, group work online allows for students themselves to create a conversation and introduce texts–rather than me introducing an object of analysis, students could post something to their group, and then have the group respond. This is of course possible f2f as well, but then the student introducing the text needs a new task. The asynchronous nature of online classes eliminates that problem. Online group work is meditative, rather than temporally bound. What I mean by this is, rather than having a task to accomplish within a set boundary, class, online discussion boards or google docs allow students to put ideas and images, walk away and think, and come back later after reflection. I’ll focus the rest of the past on the first in my sampler platter: having students create games together. I do this usually in a section of my class dedicated to rhetoric. We go through multiple forms of rhetoric and eventually end with procedural rhetoric, definitions below. 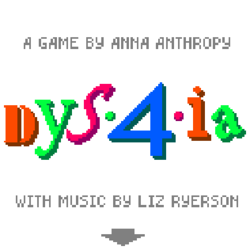 We play a variety of games in class (this is also done as collaborative activities), on a variety of topics: immigration (Papers, Please), gender transition (dys4ia and Mainichi), bullying (Lim), economic inequality (Spent and Cart Life). (Usually I teach two or three of these games per semester). Then, at the end of this unit, I have students work together to design a game, in writing, which does one of the following: 1) Makes an argument about some important topic to them or 2) Addresses a group that is usually underrepresented in the gaming community (we brainstorm about who is underrepresented. The activity usually goes well: students tend to like it; they find it creative and interesting and thought provoking. I am often not as satisfied with it, though, because it always seems rushed. It always seemed like something that, in the bounded space of the classroom, had to be quick and simple rather than something that spanned more time. I feel like all of that would potentially change if I brought this activity online. Through the asynchronous, unbounded, and meditative possibilities of online communication, I could turn this activity into a longer project. A google doc could transform into a place not to just put thoughts, but also to draw and put images of characters, to find conceptual images, to link to potential music etc. I feel like this is all possible in-class, but that the urgency to do this now may siphon some of the creativity and exploration that less rigid time constraints will allow. I could help groups use the polling features on Canvas to get marketing data, essentially, from the rest of the class: what type of character would you prefer? How should our game end? Etc. I could have students record their own thoughts on their games and designs, explaining how they contributed to the group, as a way of assessing the activity. Discussion boards could operate as spaces to test ideas, to see what other groups or doing, to collaborate between groups, to share existing games that students think might be good models. There are a lot of possibilities here with an online class. All of this, again, could be done in a f2f class (and now that I’ve written it all, I am excited to potentially try it next semester–I like this idea now much better for a f2f class than I did when I originally thought of it, so think you blog sounding board), but online it seems like it would be so much more fluid and experimental. I am realizing this post is becoming a monster, so I am going to end there (I want to jump away and start designing a prompt for this collaborative project now). This entry was posted in Uncategorized by D. Antecontreras. Bookmark the permalink.